Juan Cristobal says: – Remember Chávez’s prophetic speech about how Cuba and Venezuela were sailing together toward the same “sea of happiness“? 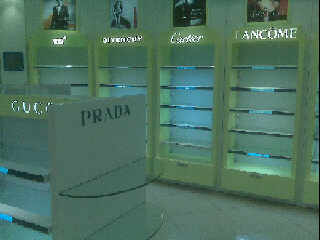 Funny, I doubt Havana Airport’s Duty-Free stores are as empty as the ones in Maiquetía (pictured left). Come to think of it, if the shelves for imported Scotch are as barren as the cosmetics and fancy purse shelves, there’s no telling what the angry mobs will do. Caracazo? Maiquetíazo! What a vision for departing tourists coming to visit our sea of happiness – all three of them.